href="http://s1211.photobucket.com/albums/cc434/mysimplewalk/?action=view&current=DSC06396-1.jpg > " > target="_blank"> src="http://i1211.photobucket.com/albums/cc434/mysimplewalk/DSC06396-1.jpg" > border="0" alt="Photobucket"> > > Grab a warm mug of cocoa, turn on those Christmas > tunes, and sit a spell with me on December 15th, for the 10 Day > Christmas Countdown! 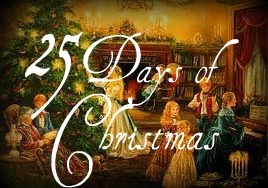 It's a pleasure to be sharing in this special blog share, The 25 Days of Christmas, started by the Parga's Junkyard Blog. I hope you check out the other blog posts sharing the holiday season with 24 bloggers who have joined forces to make this season a bit more magical..
Often the Holidays can be a difficult or lonely time for those who have no family or friends nearby, or are left behind because it is difficult to manage having one come to visit for a holiday visit-perhaps due to constraints of illness. Or sadder still, whether through ill family relations or neglectful family, the elderly or disabled family member is left behind. It is usually difficult for an elderly or sick person in a nursing home, hospital, or assisted living facility, who receives few or no visits, to watch others receive visits or go out during the holiday season. I have seen this first hand, having worked in nursing homes, a rehab hospital and mental health facility for about 18 years. Even the smallest gesture is appreciated by these people and can mean a lot. 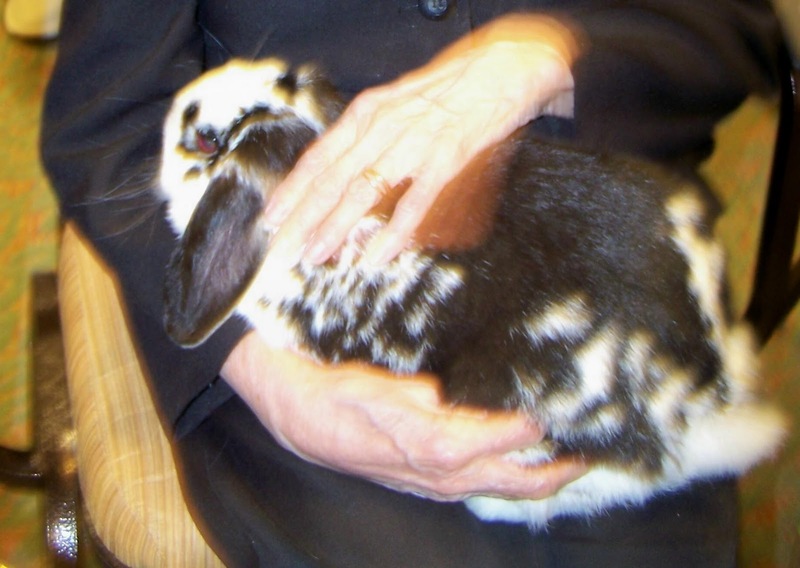 On the other hand, the warmth of a hug, for example, is nice when given by perhaps a staff person or visitor from a church, it is not always the same as when these people participate in interactions with animals. There is something about animals, that for most people will let them feel even more relaxed and free to enjoy the interaction than with people they aren't as familiar with. Often times the results are amazing! with some of the web's best bloggers! with 5 Food Gifts for the Cowboy in all of Us! Melt the butterscotch morsels in a double boiler. Let them get warm and start to melt, then stir. Mound mix into small pieces like above. over medium heat. Stir constantly. Prepare your 8" or 9" pan with foil. Spray the foil with pan spray. Stir until melted. Add vanilla and stir. place the flour, baking soda, baking powder, and salt. In your mixing bowl add butter and both sugars. On medium high, cream together the sugars and butter. a time. Beat after each addition. at a time. Mix just until it is incorporated. Place small scoops on your baking sheet. Top each cookie with mini M and M's. Bake at 350 degrees for 10-13 minutes. Break the pretzel sticks in half before adding them. Melt the butter in a medium pot on low heat. Stir until the marshmallows are completely melted. Put butter or pan spray on your hands. circles. Cow pies are not perfect. rice krispie treats into chocolate. Dip one part, then place in freezer until chocolate sets. then put back in freezer. Here are your cow pies!